US supplied TOW anti-tank missiles have ended up in the hands of Jabhat Al Nusra, Syria’s branch of Al Qaeda. 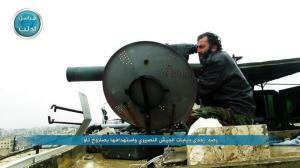 The US provided the missiles to CIA vetted Syrian rebel faction Harakat Hazm in May. A video posted by Al Nusra shows the weapons being used to take over Syrian military bases, Wadi Deif and Hamidiyeh in Idlib province. ‘ Jamal Ma’arouf, touted as a moderate by the West, admitted to The Independent that he has openly fought battles alongside Jabhat Al Nusra and refuses to fight against them. In 2012 the Free Syrian Army (FSA), referred to as the ‘moderate rebels’ by the US State Department, fought along side Islamist State In AlSham (ISIS) in Aleppo against the Syrian military for control over Menagh Airbase. The FSA head of Aleppo Military Council Abdul Jabbar Al Oqaidi, who has met with US Ambassador Robert Ford, was filmed with ISIS Emir Abu Jandal praising ISIS for helping take the base using a suicide car bomb. As late as September 2014, FSA commander Bassel Idriss said that they had joined forces with ISIS and Jabhat Al Nusra in Qalamoun Mountain.